1998: My friend and colleague in the creation of the Cloud series for PBS, Trish Kerby, was likely the first person to see the little palomino filly racing the wind atop her Pryor Mountain home. She named Raven and Phoenix’s palomino daughter, Mariah. Her BLM name is Blanca because, like her brother Cloud and her niece Encore, she was nearly white. Late in her foal year, her white coat greyed out a bit and we wondered what color she would end up being. Her mother doted on the filly as she did all her foals. When Mariah was only two years old, she gave birth to a petite bay filly who was removed in the 2001 helicopter roundup. Later that year Lakota won Mariah and, along with Quelle Couleur, they would be with Lakota until his life-ending injury in 2012. 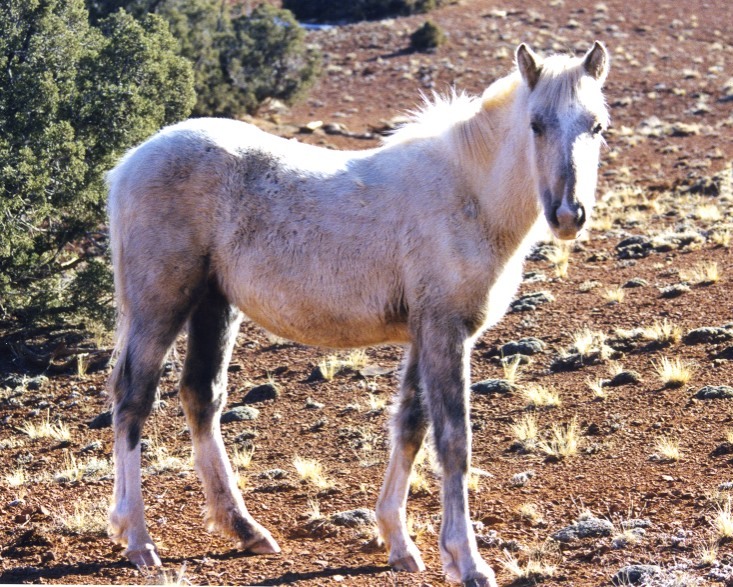 Casper (Cappuccino) won Mariah and she was with the burley dun stallion until her mysterious passing on September 9, 2017. Our friend, Nancy Cerroni, discovered her body and reports that she looked as if she had just lain down to take a nap. Would that death might always come so softly--on a sunny slope on a warm and peaceful day. Mariah was what I call a “signature” animal, one that reveals the identity of a band. Even from far away we knew we were seeing Casper’s dun family when we spotted Mariah with them. Like her mother and her brother Cloud, she was a bright light both in color and in personality. Both Galena and Galaxy were black as night with small marks on their foreheads in the shape of a comma and a parentheses. Ann Evans aptly named the two charming troublemakers “the punctuation twins." As a young adult Galena joined Jackson's big band and gave birth to a delicate dun filly in the spring of 2012. The following January we found Jackson’s band including Galena. But Mariah's granddaughter, Moenkopi, was nowhere to be seen. In going back through my horse lists for January of 2013 I had written next to Moenkopi's name "with Casper-she looks thin!" A rather ominous entry. I could only make out Casper's band through my spotting scope but have no pictures of them on this bitterly cold day. It was January 26. The worst of winter was yet to come. Can you see Quinn in the UTV? Too cold outside for even him! I needn't have worried. Moenkopi had a secret weapon. She had her grandmother Mariah. In May I found Casper's band near the low water catchment on Tillett Ridge. Mariah was running and kicking up her heals. Racing to catch up with her was Moenkopi! Lucky Moenkopi! Mariah likely treated her like her own. This is one reason I sometimes called the sweet and spirited palomino mare, Mother Mariah. I will miss you Mariah. Every time I stand in a stiff wind atop your sacred mountain home I will think of you. PS. Mariah lived her entire life in precious freedom with her family. At the Cloud Foundation, we work every day to ensure that all our wild horses and burros may have the same opportunity. We rely on your generosity to fight on. Please help us with a donation. You can set up a monthly gift which allows us to plan our strategy to keep wild horses and burros roaming free. . . forever!